It has been almost one year since the SBE began to offer the SBE MemberPlus option. If you are not aware of what this is, those who choose the option receive a significant increase in membership value. Access to all live and archived webinars the SBE produces during the membership year, at no additional cost. With the never-ending changes in technology, most SBE members look for ways to keep up at a reasonable cost. Our members’ desire to learn about new technology was one of the reasons the SBE created this membership option. Over the past several years, the SBE has produced a significant number of technical broadcast and media webinars of interest to our members, more than 70 and climbing, many of them on evergreen topics. After the live presentation, each webinar is archived and available on the SBE website 24/7/365. The SBE is grateful to the many talented and knowledgeable individuals, all subject matter experts, who have presented webinars for the SBE in the past and in the future. In the traditional membership model, members who pay annual dues of $85 would pay an additional $59 for each webinar they wanted to take. With SBE MemberPlus, which has an annual cost of $175, there is no additional cost to take as many of these webinars as you want. Just taking two webinars more than pays for the higher dues cost. We had heard from members that paying for multiple webinars was cost prohibitive, no matter if they were paying for it themselves or if their employer was. So for an additional $90 investment, a significant educational benefit was now within reasonable reach of many members. You may wonder how SBE MemberPlus has been received. I am happy to tell you that since January 2, 2018, when it first became available, we saw far more members take the option than we ever anticipated. As of this writing, 871 members have chosen SBE MemberPlus. That number represents more than 20% of all renewing Members and Senior Members, and more than 41% of all new members. Those 871 members have been using their expanded benefit in a big way. Through September 2018, SBE MemberPlus members had registered for 2,023 SBE webinars. That is 96% of the total webinars taken this year and the total is far more than any previous year! As of the end of September, 488 new members have joined and, as I mentioned earlier, 41% have chosen the SBE MemberPlus option. It’s safe to say that the added membership value has helped attract many of them. When membership renewal comes around in a couple of months, we encourage those who are SBE MemberPlus members will choose to renew and maintain that status. We also hope that if you passed on it the first time around, you will choose the SBE MemberPlus option when you renew. Looking ahead to 2019, the SBE Education team is planning a full slate of new webinars, including our series on ATSC 3.0 and more in our series on Advanced RF. The ATSC 3.0 series will begin in January 2019 with Networking for ATSC 3.0. Our growing archive of webinars incudes the popular, eight-part SBE RF 101 Terrestrial Transmission series, the SBE basic and advanced series on IP Networking and many more. If your employer has not been willing to cover the cost of traditional dues in the past, let them know about the expanded educational benefit. They may just decide that the added educational benefit, which potentially could help their station’s performance and bottom line, is worth the investment and be willing to pay for it. 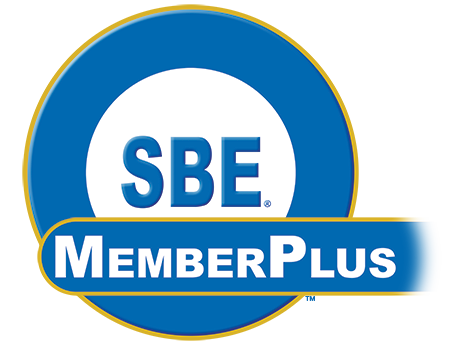 SBE MemberPlus has all the benefits of traditional SBE membership, plus access to all the archived Webinars by SBE and all new webinars the SBE produces during the membership year, at a cost of $175. Currently, there are more than 70 webinars archived and available online, with more added every month, that cover a wealth of topics of interest to broadcast and media engineers and technicians. Free access to the extensive SBE webinar education resource is an enormous benefit. For less than the cost of two SBE webinars, the member who opts for SBE MemberPlus has access to archived programs including the eight-part SBE RF101 series and five-part Fundamentals of IT Networking, as well as the current Advanced RF and ATSC 3.0 series. Q: Can I upgrade my Regular membership to SBE MemberPlus at any time? A: Yes. Annual membership renewal takes place on April 1, but an SBE member can pay the difference from Regular membership to SBE MemberPlus at any time to add the benefit. Q: If I join the SBE midyear, can I prorate any portion of my dues? A: New SBE MemberPlus members who join from October through December pay the full SBE MemberPlus rate and then will pay a prorated SBE MemberPlus amount at their first renewal cycle the next year, just as new traditional Regular members do. This will sync those members with the April 1 membership cycle. Q: Can I renew before April 1 to take advantage of SBE MemberPlus? A: Yes. Members can elect to renew their membership as early as January 2 each year to access the SBE MemberPlus program. Get up to an additional three months of SBE webinars free! Q: What if I do not renew my SBE membership by April 1? A: SBE MemberPlus members who do not renew by April 1 lose the SBE MemberPlus benefit at that time. Their membership reverts to traditional Regular membership and remains active until the three-month grace period ends June 30. The SBE MemberPlus benefits are reinstated if the member renews after April 1. Apply or upgrade to SBE MemberPlus at the SBE website, sbe.org/join. On January 1, the Society of Broadcast Engineers, the association for broadcast and multimedia technology professionals, launched its new member benefit, SBE MemberPlus. Adopted by the SBE Board of Directors at its meeting in October 2017, the enhanced member benefit allows Regular, Senior or Associate members to upgrade their membership with full access to the more than 62 Webinars by SBE. The SBE’s relatively low dues already provide access to SBE publications, social media outlets, job listings, compensation survey results and access to a life insurance program, as well as member discounts for SBE certification, education programs and purchases at the SBE Bookstore. SBE MemberPlus provides more value to members who choose to enhance their membership. Initial response to SBE MemberPlus has been positive. For less than the cost of two Webinars by SBE, SBE MemberPlus members have access to more than 62 online education programs that cover a wide range of technical broadcast and media topics. SBE annual membership runs from April 1 to March 31. SBE members received their renewal notices in early February, and already, more than 125 members have renewed their memberships or joined the SBE and added the MemberPlus benefit. Individuals can join or renew their traditional SBE membership as a Regular, Senior or Associate member (based on eligibility) at the rate of $85, and purchase any SBE online education program a la carte. 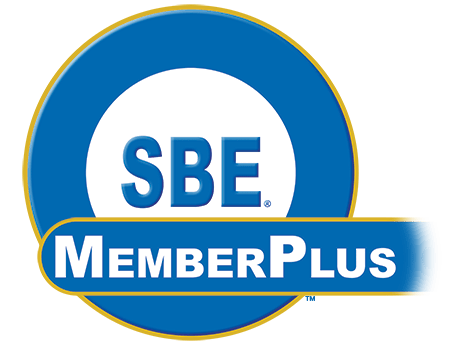 SBE MemberPlus has all the benefits of traditional SBE membership and includes access to all the live and archived Webinars by SBE in the SBE catalog plus any new webinars the SBE adds during the membership year, but at a higher cost ($175). The SBE has prepared a video explaining SBE MemberPlus. Access to the SBE webinars through the SBE MemberPlus program is limited to the member-purchaser only. They are not permitted to distribute, sell, copy, share, project or otherwise make the webinars available to any other individual or group without express written permission by the SBE.